Cats make wonderful companion animals, but cleaning up after your feline friend can be a messy and unpleasant task. If you’re looking for a solution that will make cleanup a breeze, you may want to consider a sifting litter box. These ingenious devices are easy to use, help reduce mess and bad smells, and can even save you money on wasted litter. We reviewed dozens of sifting litter boxes to identify the best of the best, based on factors including ease of use, quality, affordability, and feedback from Amazon users. We then narrowed our search down to 5 of the best sifting litter boxes on the market. A well-designed self-sifting litter box that separates waste in 3 easy steps. We’ve identified the So Phresh Sifting Cat Litter Box as the best choice for most cat parents. This sifting litter box stood out to us during the course of our research thanks to its simple design which separates waste in 3 easy steps. The So Phresh Sifting Cat Litter Box features a simple and easy-to-use design with a built in sifter tray that separates waste in 3 easy steps. The box works with most types of cat litter, and has raised sides to prevent messy spills. Reviewers say this sifting litter box is simple to use and performs well. The product is also compatible with liners to further reduce mess and odors. A convenient enclosed sifting litter box that minimizes mess and odor. 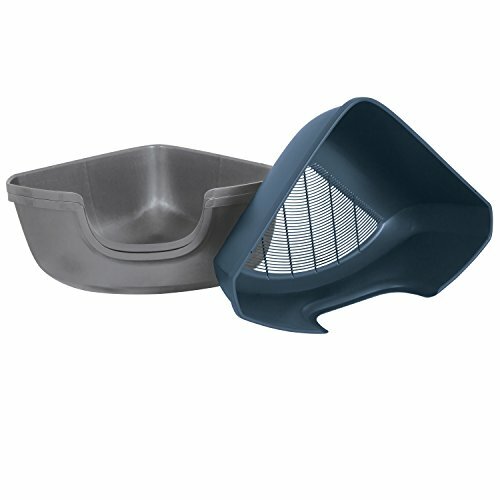 The Van Ness Sifting Enclosed Cat Litter Pan is perfect for cat parents who want the benefits of scoop-free maintenance, combined with the odor control qualities of an enclosed pan. The sifting litter box features 2 nesting pans and a sifting screen for easy cleaning. It also comes complete with an odor door and replaceable zeolite air filter. A durable sifting litter box with a 3-pan system and antimicrobial protection. The Pet Mate Arm & Hammer Large Sifting Litter Pan eliminates the need for shaking and scooping. The convenient design features sifting holes that separate soiled litter from clean litter. Added antimicrobial protection also helps prevent bacterial growth and stubborn odors. This affordable sifting litter box is designed with simplicity in mind. It features a 3-pan system with 2 regular pans and a sifting pan for efficient cleaning. Reviewers say this product is much easier to use than regular litter boxes. This corner sifting litter box features a space-saving design and low-profile entry. If you’re looking to save some space at home, the Petmate Sifting Corner Litter Pan for Cats is an excellent choice. 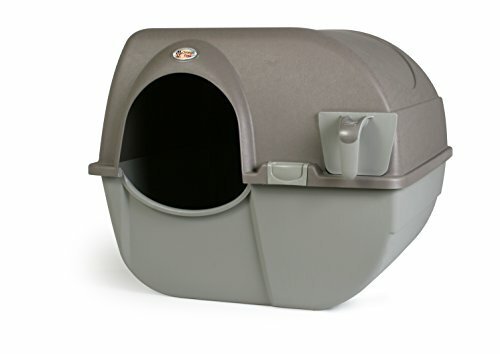 The litter box features a corner design with a low-profile entry that’s ideal for kittens or senior cats. The patented sifting technology also eliminates scooping for a fuss-free cleaning experience. This sifting litter box is proudly made in the USA from heavy-duty, durable plastic that’s designed to stand the test of time. Most reviewers say this litter box reduces mess and sifts efficiently. A covered sifting litter box with an innovative, easy-to-clean design. The Omega Paw Roll ‘n Clean New Litter Box features an innovative design that cleans in seconds. Simply tilt the box to tip the contents onto the grate, separating waste from clean litter. The litter box is made from sturdy plastic and requires no liners, filters, or electricity to operate. This model has recently been upgraded with a stronger, more durable design. Many cat parents will agree that regular litter boxes can be messy and difficult to clean. They also waste litter and can harbor bacteria, leading to unpleasant odors. Sifting litter boxes feature a user-friendly design that takes the fuss out of cleaning up after your cat. They generally consist of a sifting pan to separate solid waste from clean litter, and one or two solid bottom pans. Sifting litter boxes are popular with many cat parents as they minimize mess, save time, and reduce the amount of litter used. Although sifting litter boxes take a lot of the hassle out of cleaning up after your cat, they still require manual operation. If you’re interested in fully automatic litter boxes, be sure to check out our list of the best self-cleaning litter boxes. Ease of use. Look for a sifting litter box that features a simple and user-friendly design. Useful features include a 3-pan system and raised sides to prevent spillages. Materials. Sifting litter boxes should be made from strong and durable materials that will withstand daily wear and tear. Reinforced plastic is a popular choice as it is tough, lightweight, and easy to clean. Size. Check the manufacturer’s information and make sure to choose a sifting litter box that has adequate room to accommodate your cat comfortably. If you live in a multi-cat household, it’s a good idea to purchase an extra-large litter box that’s big enough to be shared. Corner sifting litter boxes can be a good option if you’re short on space. Odor control. If odor control is a priority, consider covered sifting litter boxes that trap bad smells inside. Some sifting litter boxes also feature antimicrobial protection to help prevent the growth of odor-causing bacteria. What is a sifting litter box and how does it work? A sifting litter box is a type of litter box that separates clumps of waste from clean litter. It generally consists of a sifting pan and one or two solid bottom pans. When you need to empty your cat’s litter box, simply lift up the sifting pan and allow the clean litter to fall through the holes into a bottom pan or separate container. You will then be left with solid waste on the sifting pan which can be easily disposed of. How do you get the sifter back under the litter after emptying it? 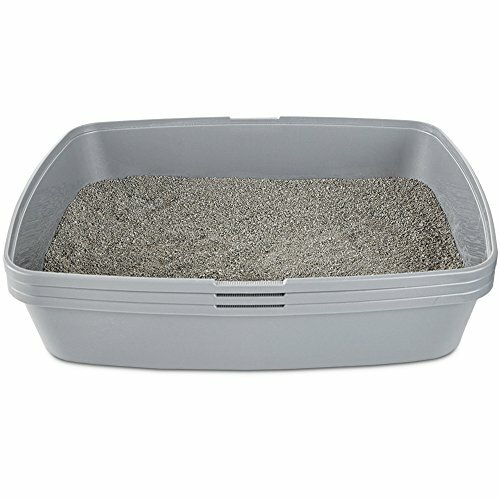 Many sifting litter boxes feature a 3-pan design which allows the sifting pan to be positioned between two regular pans. When changing your cat’s litter, simply pour the contents of the top pan into the sifter, discard the waste, then place the sifter over the clean litter in the bottom pan. If you choose a sifting litter box without a 3-pan system, you will need a separate container to transfer litter. How often do you change a sifting litter box? Sifting litter boxes are quick and easy to use and should be emptied daily to control odor and bacterial growth. When the level of litter in the box is running low, simply top up with fresh litter. Do sifting litter boxes work with all types of cat litter? Self-clumping litter is the best type of litter to use to avoid liquid waste falling through the sifter. It’s also important to choose a fine-grain litter that will pass easily through the sifting pan. We looked at 20 other sifting litter boxes. Even though they didn’t make our 5 best sifting litter boxes, they’re the best of the rest and each is still is great option for your cat. The information you’ll need to compare each one is included with the listing. This sifting litter box from Animal Treasures features an open design with a high rim to prevent messy spills. A durable, washable sifting litter box with a functional design that minimizes mess and fuss. A well-designed uncovered sifting cat litter box with a double layer design and liner pads drawer. A sturdy sifting litter box with a 4-piece design and molded rims for extra strength and stability. A scoop-free sifting cat litter box with a convenient “lift-sift-flip” design that saves time and minimizes mess. An innovative sifting cat litter box with a semi-automatic cat toilet design, active cat litter separation grid, and drawer-style cleaning box. A durable and functional sifting cat litter box with a 3-pan design that makes clean up a breeze. A simple, 3-pan sifting litter box from Sift Away with interlocking trays and a splatter shield. This extra-large, lift-to-sift litter box from So Phresh features a built-in sifter that cleans up your cat’s litter box in one easy step. An easy-to-clean sifting litter tray made from odor and stain-resistant plastic. Reviewers say this product is best for kittens or small adult cats. A hygienic, easy-to-clean litter box system that includes 2 trays and a sifting pan. 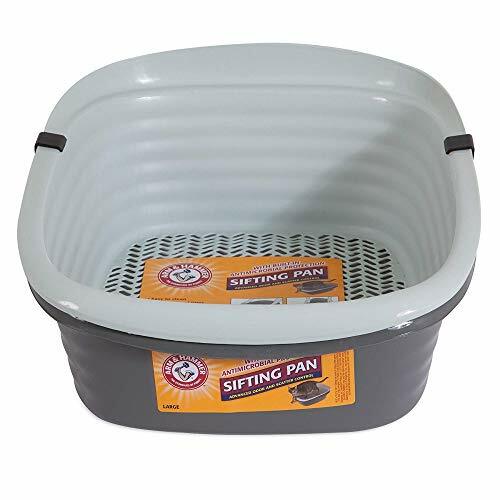 A 3-pan sifting litter box from Van Ness with a framed pan to reduce spills and hold pan liners in place. This newly-designed sifting cat litter box from Van Ness features a removable frame and highly polished finish for odor and stain resistance. This simple and effective sifting cat litter box features a 3-pan design for convenient and easy disposable of waste. A sifting litter box with a 2-stage flip top cover and integrated step screen to minimize litter scatter and tracking. 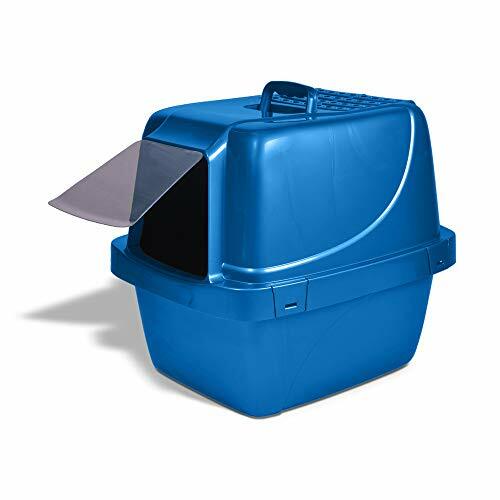 If your cat likes some privacy when using their litter box, consider this covered sifting litter box from Catit. This ingenious and unique covered sifting litter box from KittyTwister features a circular twisting system for fast and effective litter sifting. This unique covered litter box sifts self-clumping litter by spinning waste into an integrated drawer. A fully enclosed covered sifting cat litter box with 2 nesting pans and a sifting screen. This 2-pan sifting litter box features a removable frame with an integrated step screen, and a space-saving corner design. Richard is a writer and marketer for the pet industry. He is from the UK, but has lived abroad in Japan and South Korea. Richard has shared his life with pets since childhood, and currently has a rescue pug named Bertie. These days, he works with veterinarians and pet businesses to improve their marketing and increase profits. To find out more, please visit his website.